National Institute of Water & Atmospheric Research, New Zealand. Scott has been involved since 1993 in research at NIWA, investigating continental margin sedimentation, earthquake parameterisation of active faults, carbon fluxes within marine ecosystems, Southern Ocean iron fertilisation, pelagic-benthic coupling and ocean time-series observations. He has participated in almost 50 research voyages and at various stages of his career has been the programme co-ordinator of NIWA’s ocean ecosystems research. This included involvement in the first meso-scale iron fertilisation experiment in the Southern Ocean (SOIREE). 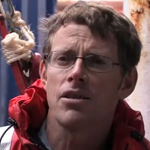 Over the last 10 years, he has focussed on the collection of time-series information from subantarctic and subtropical water masses at the northern terminus of the Southern Ocean to look at potential linkages between surface processes and the export of organic material to the deep ocean interior.